Are You Tough Enough To Accept The Challenge? For 2019 in conjunction with the Butterfield Gulch Gang's match... "The Siege At Clark's Station" , I am calling out all Classic Cowboys and Cowgirls across the country! That is right a challenge for a showdown on the plains of Kansas has been issued! Do You Accept? 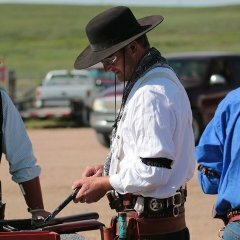 It takes a certain person to shoot the Classic Cowboy/Cowgirl category, with all the clothing, firearm, caliber, and such requirements... it truly takes dedication. I have shot with many great folks in a few surrounding states that are great examples of Classic Cowboys/Cowgirls. But I want to shoot with MORE OF YOU FINE FOLKS AND BATTLE IT OUT WITH A BIG GROUP OF CLASSIC SHOOTERS! So come on... accept the challenge and sign up for The Siege At Clark's Station. All you have to do is sign up as either Classic Cowboy Or Classic Cowgirl to be entered in the SHOWDOWN. If you have ever wanted to give the category a try now is your chance, and learn some things from those that have been shooting it for a while. Butterfield Gulch is located in central Kansas, just south of historic Chapman, KS... just a short ride from Abilene, KS. So it is right in the middle of some of the most famous "End Of The Line" cattle drive towns! Butterfield Gulch brings you seven permanent stages ranging from a Fort, Gallows, Stage Depot, and others. Also have a great long range, with shooting from 100yds to 400yds. 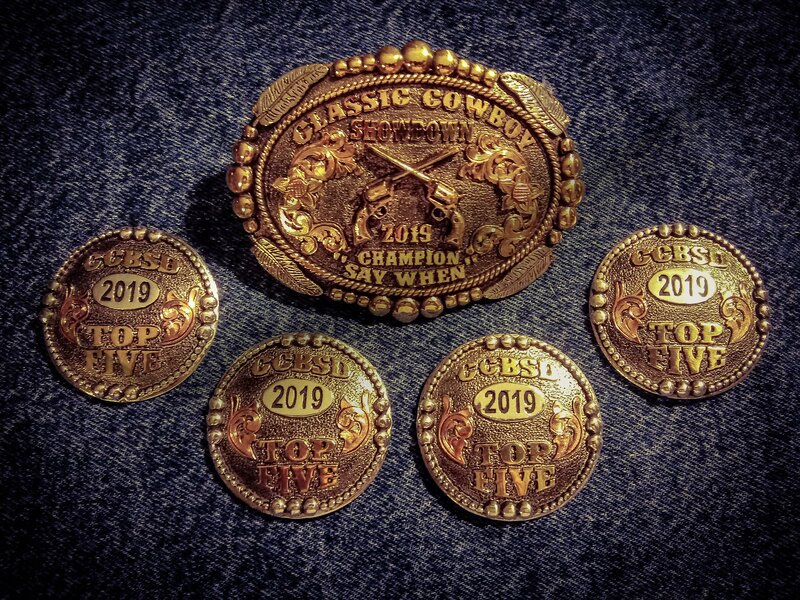 I will be putting up a custom buckle for the event if we can get at least five (Classic Cowboy) shooters signed up for it (Three Classic Cowgirls for a Buckle).. and possibly some other awards TBD. Working out some details for a Classic Cowboy/Cowgirl Dinner get together on a Steam Train! More info on that later so keep tuned in! I would love to see a huge gathering of classics for this match...unmatched at any other shooting venue! BUCKLE AND CONCHOS ARE DONE!! Keep checking back for more info. UPDATE 7-20-18 - FRIDAY NIGHT SOCIAL TRAIN RIDE... See Below Post for more info. UPDATE 1-4-19 ANOTHER AWARD OFFERED UP! 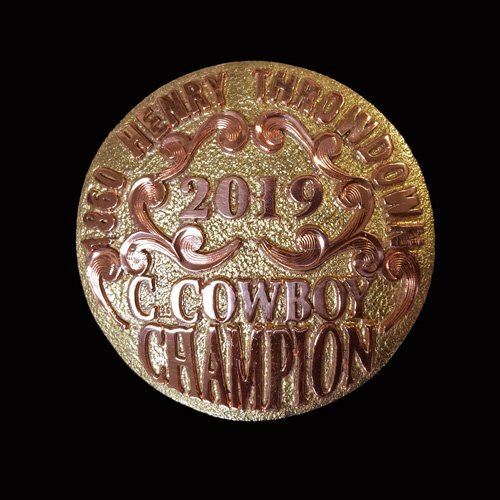 A﻿bilene ﻿Slim has offered up a CUSTOM 2" Scarf Slide for an "1860 Henry Throwdown". Abilene Slim just loves the 1860 Henry and knows many folks own one and enjoy shooting it, but often shy away for some reason or another... To tempt people to use it for a main match he has offered up this award ﻿to the TOP shooter that uses the Henry for all 10 stages! So if that is something that interest ya, just let me know when you register that your shooting the HENRY. Count me in!! Dinner on a steam train. Sounds great! Thanks Major for doing this again. PLUS. After beating me like a drum last year. I am after REVENGE! Hud, I noticed Major has a new hat and it is much larger then his old hat. Ya' never know what my little brother's up to and you always got to watch him closely. I think he actually practices drawing and reholstering and transitions. Ain't that sum kind of dedicashun? Sounds like a match NOT to miss. They run a good one there at Butterfield! Yeah I think it would be cool. I just need to talk to them to see if there is a minimum # and cost. The way I understand you can ride the train and bring your own catered meal too.. so there is an option as well. Let you all know what I get figured out. Count me in! 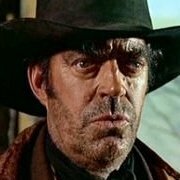 I would never miss the Butterfield Gulch match! So a catered dinner on steam train, just ain't going to work out. Not sure we can meet the minimum people required. Would folks be interested in a diesel train ride (approximately 1hr 45minutes) from Abilene to Enterprise and back? This would be on a donation basis, what ever you want to chip in. Get get dressed up and have a quite the social! 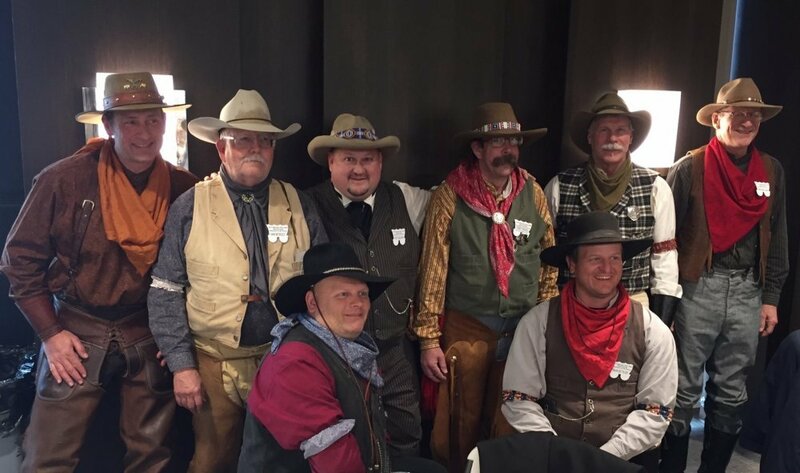 Not one of you Classic Cowboy or Cowgirl, Just an OLD F**TS, but Miss Connie and me would sure go with y'all .Bulldog I could wear my CC outfit. No problem, the train idea would not be just for the classics.... Anyone may ride along. Still trying to work out details yet. Would folks be interested in a diesel trailer ride (approximately 1hr 45minutes) from Abilene to Enterprise and back? This would be on a donation basis, what ever you want to chip in. Wouldn't that be something? Folks show up and that is what I had? It Is Official, We Done Got A TRAIN! 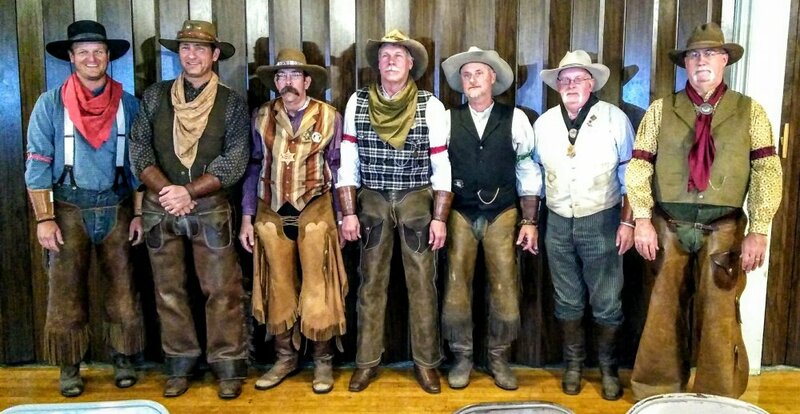 Sign up for The Classic Cowboy Showdown, In Conjunction With The Siege At Clark's Station, May 3rd - 5th, 2019, & Join The Butterfield Gulch Gang As We Offer You A Friday Evening Social Aboard A Train That Will Take Us From Abilene To Enterprise And Back!! I Don't Know About You But This Sounds Like A Dang Good Time, And Your Not Going To Wanna Miss IT! So Get Them Entry Forums In Quick To Help Us Finalize Planning. ( Please make a note on entry forum if you would like to attend the train ride and how many). This Train Ride Social Gathering Will Leave Abilene Around 6p.m. on Friday the 3rd. (Approximately 25 Minutes From The Butterfield Gulch Shooting Range). Snacks/Drinks Will Be Provided, But Feel Free To Bring Some to Share If You Would Like (food is allowed on train). The train has three main cars, one dinning car with A/C (seats 56)... and two open cars with Canopy tops (seat 40 each). Personally I think the open cars would be great in the cool evenings in May! Directions to The Train Depot will be included in shooters packet! Sorry but No alcohol is allowed on the train. 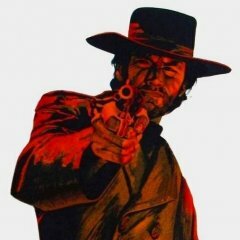 I have talked to the folks Abilene And Smokey Valley Railroad and they even will allow us to wear our firearms if anyone so chooses, they just have to be unloaded. 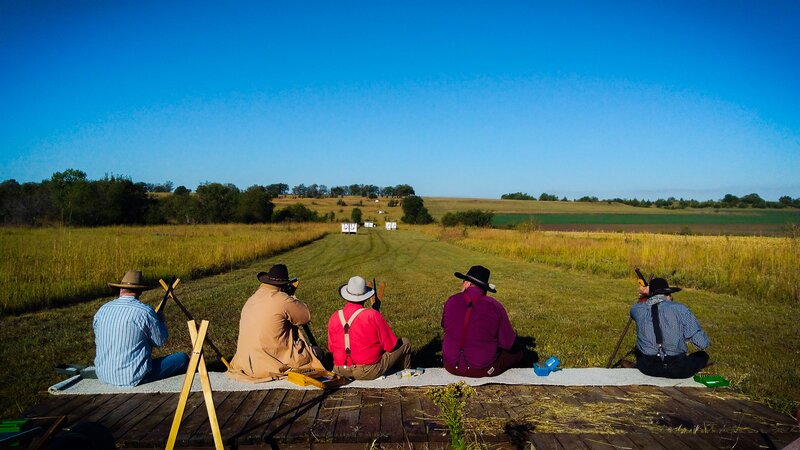 Siege At Clark's Station Presented By The Butterfield Gulch Gang of Chapman, KS. Look Below for links to our website and entry Forum... we look forward to having you join us in 2019! Back to the top for a look. If you plan on attending as a Classic please let me know as i would like to start a who's coming list. I'm in for classic -- and an 1860 Henry Challenge! What is the 1860 challenge?? Some of us would like to have an event using the oh so classic 1860 Henry. A great rifle that just don't get the credit it deserves. Been pondering on coming up with some type of competition with one. A classic's challenge to all competitors so to speak. That sounds like it would be a lot of fun. Oh, you'd better bring yore 1860. No doubt Major will have sumptin' gud fer us ta do with them Henrys! He's a wiley one, that feller. Sign up and join in the fun, would love to have ya! Even got a train rented for a Friday night social! Who's Coming List Added to Original Post! If you plan on attending as a classic cowboy/cowgirl let me know even if we don't have your entry yet, I will get you added to the list! Look forward to shooting and hanging out with you fine folks! Some of the Classics that attend this years event in conjuction with the Nebraska State Shoot 2018. We had 13 classics signed up thia past year... But unfortunately bad weather and such kept many at home. I would love to beat 13 for 2019... So sign up! Major and his gang always put on a fantastic shoot. Not the biggest in the country, but tons of fun and great folks and a fantastic banquet. This is always my can't miss match of the year! Thanks Pard! We sure try and do our best. Got lots of things plannned... So folks please cone check us out next year. Friday May 3rd, 2019 starting at 9a.m. now THAT will be fun! Bringing it back to the top... Folks. I have added a few more to the shooters list for claasics. Most of them are just verbal comfirmations as of right now... But by golly it looks like we are on the rifgt track for a great gathering of Classics! i haven't got signed up yet but I plan on making the showdown for 19. Can't wait to shoot with a bunch of classics.